Some of the best GoPro movies show the same activity from multiple perspectives. Whether you’re using multiple cameras to capture the scene, or shooting several times with the same camera, consider the importance of showing the scene from different angles. Toward the camera: Position the camera so action moves toward it. Away from the camera: Place the camera behind the subject. POV: Wear the camera to capture that point-of-view perspective. Side view: Capture the action passing the camera. Overhead view: Shoot a graphic perspective of the scene from above as shown. From below: Cover the action as it passes over the camera. 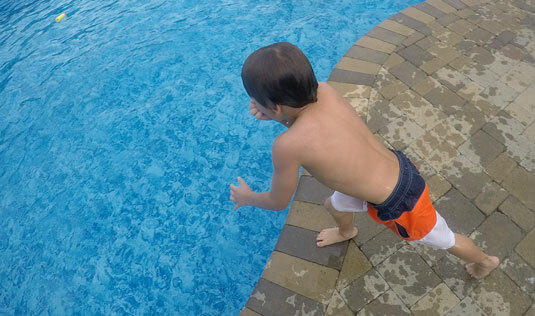 Overhead of kid about to jump in pool. Remember to shoot your movies with variations of the scenes you plan to use. There’s a misnomer that suggests shooting as much footage as possible, sort of like the Alfred Hitchcock version of a gorging bear, so you have a lot to put together later. Not the best plan. It will take you a long time to make sense of it, and you’ll also find that you use the key scenes you intended to shoot anyway. Instead, try to capture the necessary shots with the appropriate variations with camera angle, focal length, and camera to subject distance. So if you wish to depict the subject entering a key location, you can concentrate on the variety of ways that happens with an eye on how it comes together in editing. Wide, Medium, Tight: Shoot each scene with these variations. Since GoPro provides three settings of an ultra-wide view, it means these variations are accomplished by alternating your distance to the subject. Hold each shot: Whether you need two seconds in your movie or two minutes, always shoot the scene much longer than you anticipate on using it. A good place to start is recording each shot for at least 10 seconds. Vary your angles: Don’t shoot the entire movie at eye-level; instead, break up shots by placing the camera up high or down low. Establishing shot: Be sure to shoot a strong opening shot for the film as well as for each key scene. Limit each take: This is where rehearsing comes in handy. Try not to shoot more than three takes, unless you’re looking to be William Fincher (Fight Club, The Social Network). He’s notorious for shooting tens of takes. Clint Eastwood, on the other hand, shoots many of his scenes in a single take.